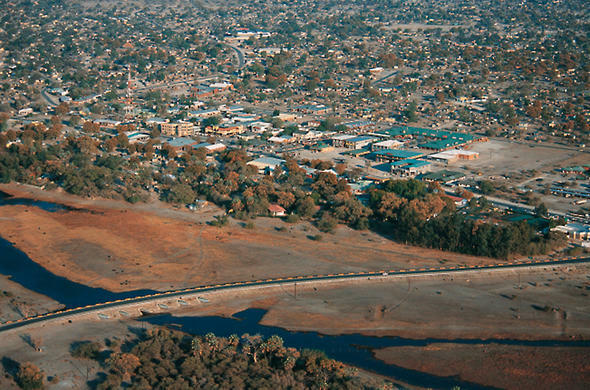 The town of Maun is the third largest in Botswana. It is an eclectic mix of modern buildings and native huts. There are shopping malls, banks, restaurants, a few hotels and some happening bars. Maun is the tourism capital of Botswana and the administrative centre of Ngamiland. 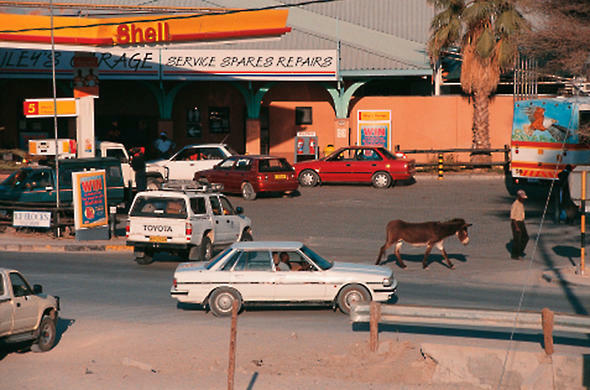 It is also the headquarters of numerous safari and air-charter operations.Regular provision of almost anything can be bought in Maun, and the town boasts several good shopping centres, filling stations, a range of hotels and lodges as well as a variety of car and 4 x 4 vehicle hire. 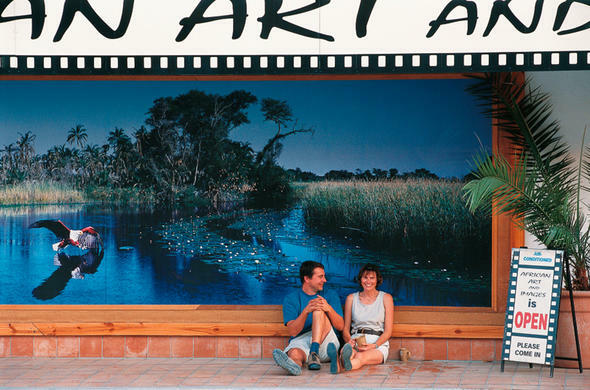 Most tourists enter the Okavango through Maun, situated at the gateway to the Delta and Moremi Game Reserve. Maun International Airport which was officially opened in 1996 after extensive renovations, is serviced by Air Botswana and there are direct flights to Johannesburg in South Africa. However, most of the air traffic is associated with ferrying travellers to the many lodges in the area and the ever popular game flights. 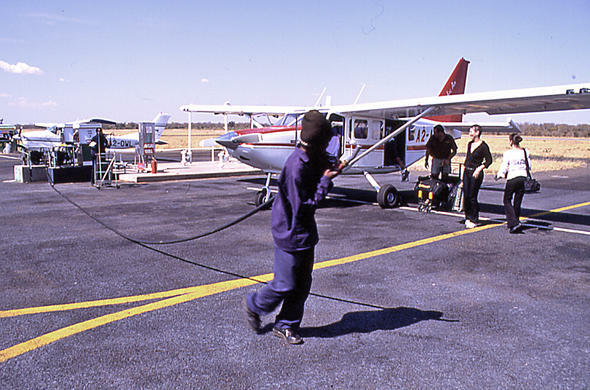 The Maun Airport is one of the busiest airports in Southern Africa, when one takes into the number of flight arrivals and departures per hour. The name Maun is derived from the San word 'maung', which translates 'the place of short reeds'. The village started in 1915 as the capital for the Tawana people. The capital was transferred from Toteng after glorious victory over Ndebele King Lobengula. This metropolis is now distributed along the wide banks of the timeless Thamalakane River where red lechwe can still be seen grazing next to local donkeys, goats and cattle. As one crosses the new walkway over the Thamalakane River to the main commercial centre, the Best Western Riley's Hotel is situated on the riverbank to the left of the main traffic circle. This stunning hotel is a very popular stopover with tourists traversing into and out of the Delta, and has been an important site in the town since the 1920s when Charles 'Harry' de Beauvoir Riley first arrived here.In those days it was a gruelling 35-hour distance from Francistown to Maun for the men, mostly professional hunters. All they wanted to do on their arrival was relax and perhaps have a cold drink. Thus, Harry grabbed the opportunity and set up a little bar that was the scene of many wild parties. Other areas in and around Maun include the small Maun Game Reserve which covers only 8km2 of woodland. It follows the Thamalakane riverbank upstream from the Best Western Riley's Hotel and consists of the original 'Place of Reeds' from which the town derived its name. The reserve is open every day and is negotiated by various walking trails. The best time to visit Maun is during the winter months from May to October when there is little or no rainfall and the days are warm and cloudless. The nights can be cold, so take something warm. November to April can be very hot, with most of the rainfall between December and February. The 2.5 sq km Maun Enviromental Education Centre, on the eastern bank of the Thamalakane River, provides schoolchildren with information about wildlife and the bush. The Crocodile farm: The Crocodile Farm is 12kms South of Maun on the Sehitwa road and open to visitors. General information on crocodiles farming and Nile crocodiles is provided. Ostrich Farm: A new attraction in Maun is the Boro-bonche Ostrich Farm, 9km from town on Moremi Rd. Open from Monday, Wednsday, Friday and Saturday from 10am to 4pm.